WOAH what a day! Today the team were taken on a tour of Cappodocia to take a look at the different areas we would be filming. I suggested the team take minimal equipment with them enjoy the area, make plans for filming and just have a general recce. First stop was to take a breath taking look at pigeon valley. The landscape is just amazing here. Natural beauty of rocks and caves made famous by the likes of star wars it is no wonder film crews love to use Cappodocia. Our funny lively host Ramadan told us all about the history of the city and how it came to have so many caves. Keeping the team upbeat with lots of jokes and banter. We enjoyed some Turkish tea looking out at the beautiful mountains. The best thing was seeing the faces of the young people who just couldn't believe what they were seeing. Pictures can just not do the landscape justice. If you ever get the chance to visit do if not just for the amazing view. With heavy hearts we dragged ourselves away from the amazing view but were promised with more adventures. Off to the open air museum we went. The open air museum had amazing views also but more interesting were all the caves you can explore and within the caves are several churches with some beautiful art work in them. 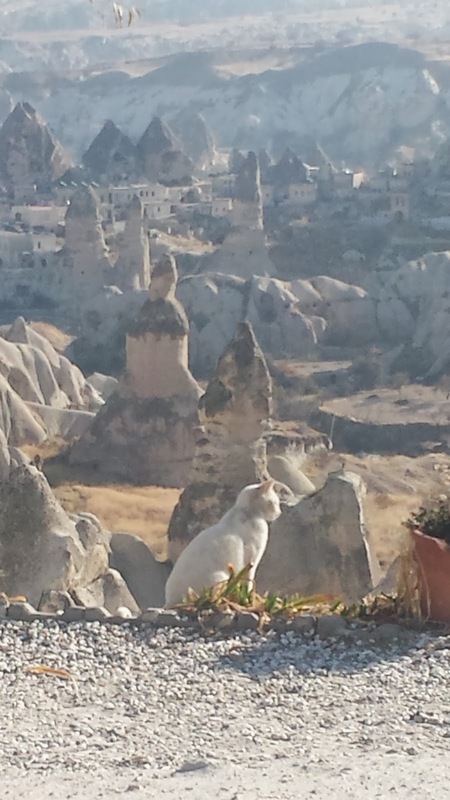 Real or not is for you to decide but I am a bit skeptical about the 'Last Supper' being held in Cappadocia. I am pretty sure Jesus chilled out in Jerusalem for that kind of thing. Although the caves were really cool to look at and imagine people living it I found it seemed to get a bit samey after a bit and I kind of lost interest so just stuck in to getting pictures of the team plotting new ideas for their documentaries. 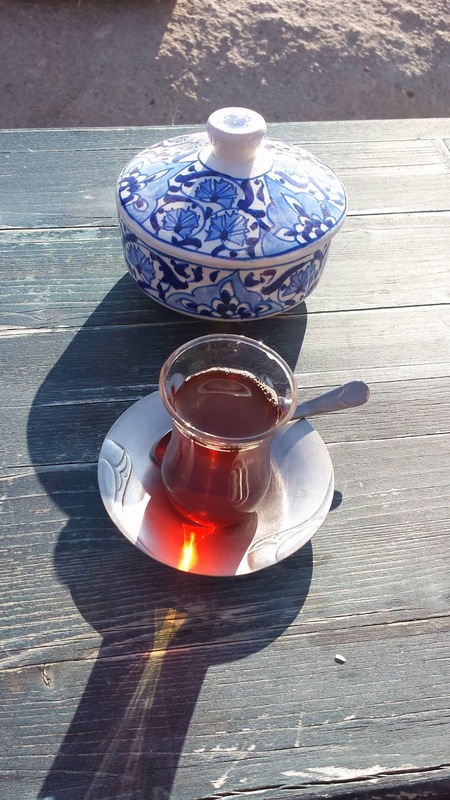 You can't go to Turkey and not go see some hand made pottery. We enjoyed some apple tea and even got to have a go at making a pot. 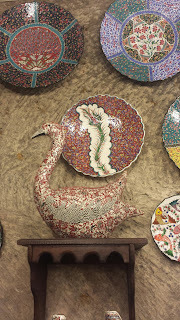 The pots are all hand painted in small tiny dots which must take hours to do but it is an amazing talent. Sadly they are way out of most of our price range and even though I thought they were amazingly talented and had beautiful work to look at I just couldn't see myself parting with 1000 TL for a plate. 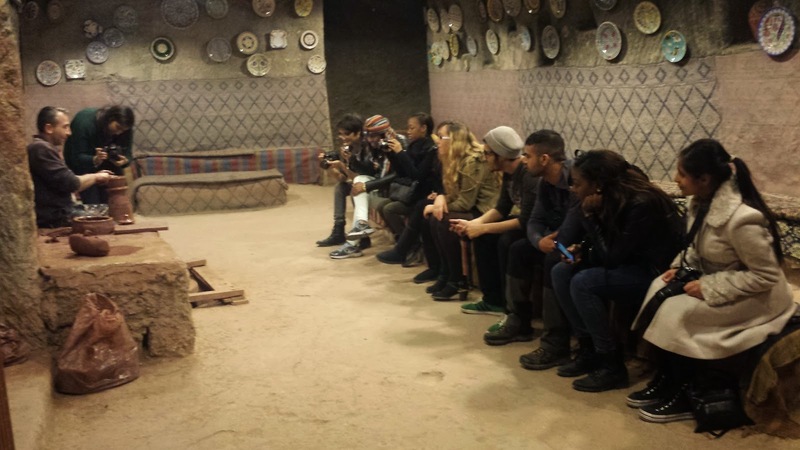 It was still a valuable experience to learn about the culture of pottery making in Turkey. The team managed to get some fotage and practice their hand held skills. We ventured on our jam packed journey this time stopping to look at some Fair chimneys which I will tell you more about in a later post as we will be going back to these places a few times to get filming done. The team were more interested in the camel and they all had a go riding the camel for just 5TL. Personally I do not agree with riding camels for fun the poor thing looked fed up and worn out and just had to walk round in constant circles without water which just made me sad. The team really enjoyed the experience though. I am sure the camel is well looked after really it just makes me sad to see things like that. There was a valley we stopped off in which is called imagination valley you look at the rocks and see what your imagination shows you such as the 2 kissing monkeys, the dancing couple and some others....I think they are all man made but even if they are it is still pretty impressive. The next stop was one I had been dreading all day. The underground city. I know you are thinking. What is her problem? An underground city that sounds amazing. No! No! No! it was cool to find out that this city had been built underground by hand centuries ago to hide from enemies and as protection in the winter and I went in for a little but but the tunnels get tiny and cramped and a few of us just found it way too small down there and ran out as quick as possible. The Turkish guards seemed to think this was hilarious and just couldn't see why we would want to get out of the cave. I guess they are so used to going down them that it doesn't seem like a big deal to them but a wuss like me the impending doom of going deeper into a cave that gets smaller and smaller just does not float my boat. The one girl who went first into the tunnel and had to come back out described herself as feeling like a prawn....now when is that a good look? For the brave people who do not mind small spaces they carried on and came out with tales of tombs and skeletons....thanks guys I will just watch the footage and give it a pass.